Here’s another project aiming to make DIY robotics as easy as child’s play. Moti is a smartphone-controlled smart motor, currently seeking funding on Kickstarter, that can be attached to everyday objects like cardboard boxes or more elaborate 3D printed creations to let kids (or big kids) build robots that are controlled via a smartphone app. Think of it as a DIY Sphero. “It’s an ideal servo that has a built-in Arduino-compatible microcontroller, a bunch of on-board sensors, continuous rotation and encoding, io pins for adding electronics, a web-API, instant networking with each other, and control over bluetooth,” explain Moti’s Toronto-based makers on their campaign page. Moti’s makers have built very granular control into their device, so the user can dictate a specific number of rotations and have the motor “stop on a dime”, as they put it. That granularity allows for or program a sequence of movements to be programmed via the corresponding Android app. 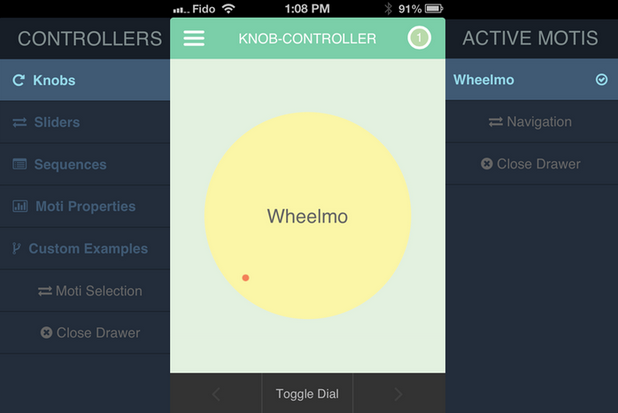 For controlling live movement, the app includes a graphical interface so that the user can, for instance, spin a wheel on the touchscreen to turn the motor, or move a slider. It’s that instant connection between software action and hardware movement that Moti’s creators reckon will capture kids’ imagination and turn your playtime munchkins into little hardware hackers. Multiple Motis can be daisychained together to allow for the creation of larger robot projects. Or used singly to control individual objects — use-cases Moti’s makers have hacked together in the latter scenario include a remote control for angling the slats on a household blind, and for moving a camera situated on a dolly for stop motion capture. Additional electronics can be attached to Moti to build out more elaborate robotics, if that’s your bag — each Moti has an Arduino-compatible microcontroller inside so it can be reprogramed or extended by adding sensors and shields. There’s also a web-API so developers can create other apps and websites that control Moti-powered robots. “We picture new kinds of video games, visualizations and tutorials that integrate with real world contraptions,” they add. All this is moot, for the moment. Moti’s creators are seeking a rather hefty $165,000 in crowdfunding — to pay for a first production run of 2,000 Motis and convince investors the concept has legs. They’ve raised just over $12,000 of that total so far, with only 12 days left on the campaign, so they’re going to need a big push to hit their target. A minimum pledge of CAD$60 is required for backers to bag one Moti (sans accessories such as power supply). Or from CAD$90 to get a Moti with a Bluetooth shield so it can be wirelessly controlled. Shipping is pegged at June 2014.